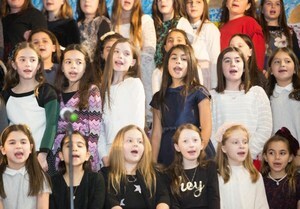 Last week, the fourth grade artists and performers dazzled parents, grandparents and guests with a spectacular gala art exhibit and musical repertoire. The lunchroom and gym were transformed into an elegant art gallery. Guests were greeted by students at coat check. Ushers and tour guides helped guests navigate the galleries. White gloved students circulated with hot hors d'oeuvres as the guests enjoyed the art on display. During both art class and M.I. Time, students emulated the works of Alberto Giacometti, Edgar Degas, Vassily Kandinsky, Kessler Woodward, Sonya Delaunay, Pablo Picasso, Claude Monet, Edvard Munch and Rabbi Yitzchok Moully. As you entered the corridor leading in to the gallery, the walls were lined with amazing Giacometti sculptures, each depicting the unique interests of our students. Yitzchak Moully made a guest appearance and welcomed the artists and their guests as they shared their masterpieces that they co-created with the artist. Playing on the large screen was a power point presentation from their trip to the Lower East Side and the Eldridge Street Synagogue. As the lights dimmed, guests were ushered to their seats to be entertained by the grade-wide musical performance. The program began with an introduction by Ms. Hammer. The procession of students filed on stage and performed a combination of songs, poems and liturgy. Xander Stein proudly played the djembe and drums which added a special beat to the grade-wide performance. The students also performed an original cantata written by Janet and Ronald Goldman. The evening ended with a reprise from Magic To Do. Applause rang out in the auditorium and the students' faces were beaming as they took a bow. Hakarat Hatov to Mrs. Royce Maron, Mrs. Jill Goldstein, and Mrs. Janet Goldman for inspiring our students with an awareness and love for the arts. Thank you also to the entire fourth grade staff and Ms. Tova Zucker for the guidance and countless hours spent preparing for the Evening of the Arts. We also thank the many generous sponsors that made the evening such a success.